Florida characteristically endures a very dry spring and our rainy season coincides with the onset of summer. This season started out kind of slow in June and July with irregular, hit and miss afternoon thunderstorms. 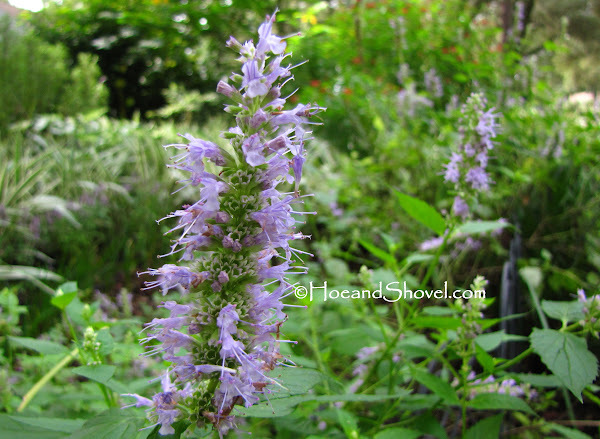 Agastache 'black adder' has been blooming since early spring in the front garden. Since it prefers the soil dry and the sun shining the blooms are not quite as perky in late summer. August rolled around and the heavens no longer held back. We started the month out with six inches in one day. 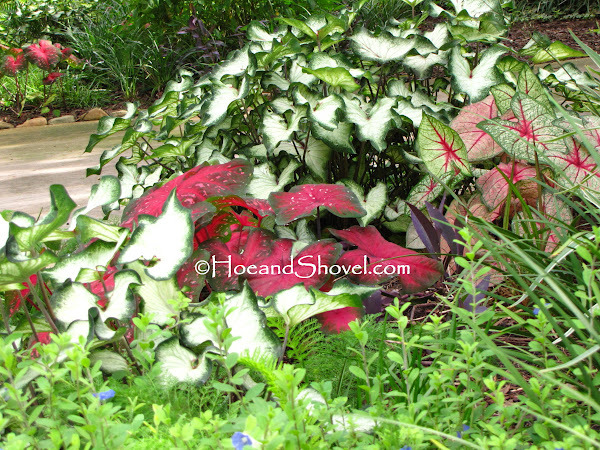 As long as caladiums don't sit in soggy soil they are most appreciative of our humid rainy summer. These are on a slight slope next to the street in the front garden where it drains quickly. It's a good pattern for Florida gardens to get so much rain in summer and one we count on for establishing our spring plantings. Regular readers may remember the front lawn renovation with the removal of the turf grass coming out in stages. The last of it being removed just this past spring. You can review the initial posts with before photos here. These two views (above) of the northerly view looking across the driveway reveal the rapid growth just one summer of sunshine and rain can bring. I have to say I don't miss the grass one tiny bit. The combination of new plants mixed with the established plants seems to have made a comfortable blend. The maintenance is practically care free now that everything is all settled in and cozy. 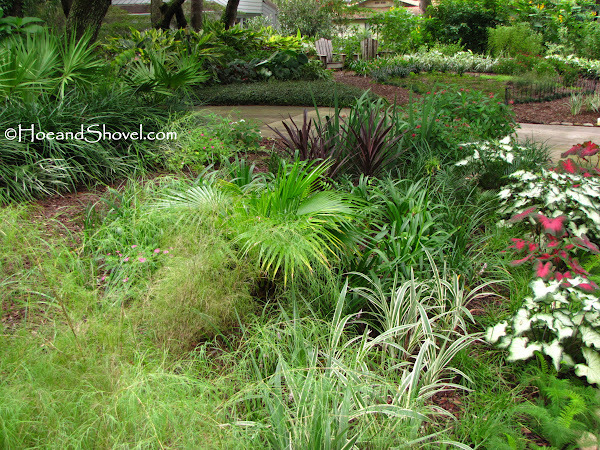 Florida-Friendly plants mixed with natives turns out to be a very good fit for taking the place of grass. It suits me and it suits the environment we are working to develop in our garden. I love your yard Meems!! Grass lawns are just not made for Florida. Wish I could get the other half to agree to no grass. You have done a wonderful job replacing it with plants. 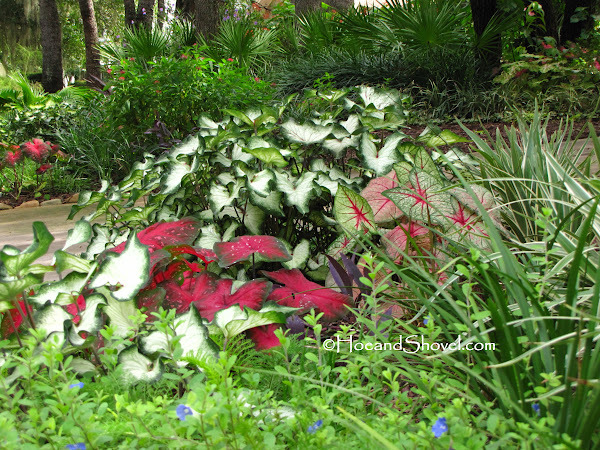 Your caladiums are gorgeous! It's amazing that you find the time to take care of the beautiful yard on top of all your writing and other activities. Thank-you, happy Labor Day weekend! Hasn't the rain been just wonderful? Your garden looks so lush! What are those blue flowers on the bottom of the last picture Meems? Dear Meems ~ I love what you have done with your front garden beds. We've done away with the majority of our grass over the years and not sorry it is gone either. 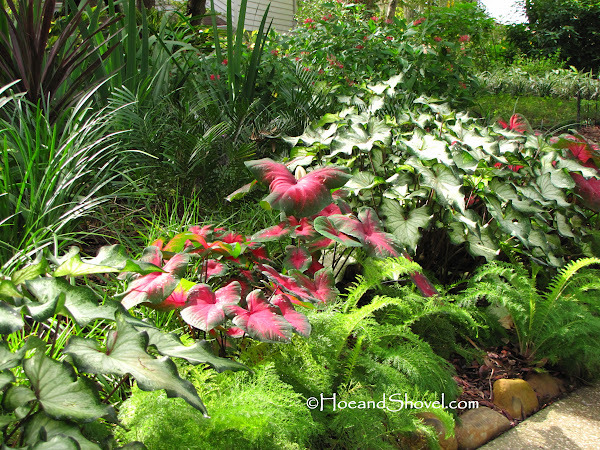 Your gardens are a wonderful mix of color, textures, and shapes and so lush looking. The rain has been good after several years of drought. Happy labor day to you, too. The rain always gives me a big break from *thinking* ... lots to keep up with if rain is lacking. The blue daze would work really well in your sunny garden. It is considered an annual but acts like a perennial here. Because mine is on the edges of tree cover it returns after being knocked back from freezes. It requires lots of sun. The garden looks great!! I have a question. How long has your candlestick cassia been in bloom? Do you have to stake it up? Do limbs ever break off? I absolutely love your garden, here in Max the rains were sparing on my side of town. But what we got really helped. Look forward to seeing what's next. 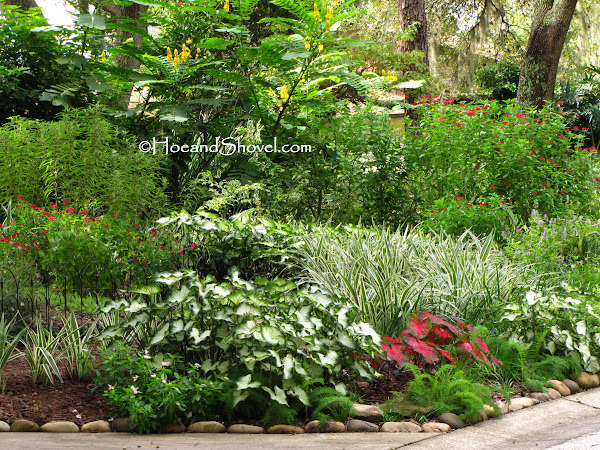 Beautiful...oh to just see something green again...so sad here in South Texas :( Pamie G.
Your front lawn looks great! I really like what you replaced the grass with. These are all south of the driveway? My white caladiums are starting to fizz out, turn brownish, get droopy. Time to start replacing. Any recommendations what I should replace with? Thank you. The candlestick in the back garden started blooming in July. The ones you see in the front a bit later. The branches that came back on old root stock got very heavy and several have broken off... much to my sadness. The plants visible in these photos (self seeded) seem to be fine although a couple of branches could probably use a good stake. Hopefully I'll get around to that this week. So nice of you to visit. Thank you. Tucson is humid? You are right it causes me to wilt but the caladiums love it. Welcome... thank you for stopping by. I am very sorry for your TX sadness... it has been a very tough summer for you. I am praying relief is on the way... soon. Many thanks for your kind words about the front garden. It will take some time for the groundcovers to fill in and look mature. What you see in these photos is north AND south of the driveway. The house faces West. I never tire of looking at your garden. I can't wait to have more shade. The heat has been terrible on mine the past two years.